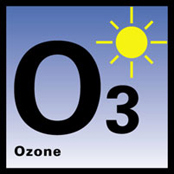 Ozone concentrations in the atmosphere build up and dissipate through the course of a typical day as the weather, amount of sunlight, and number of cars on the road change. The formation of ground-level ozone gets started early in the morning. As we begin the day's activities practically everything we do, from plugging in the toaster to driving our cars to work, generates ozone-forming air pollution. The most significant of these are volatile organic compounds and nitrogen oxides. Vehicular traffic is by far the largest source of precursors. After the commute is over, continued traffic emissions added to the earlier pollution begins to form ozone as the sun's heat and light intensifies. During warm summer months, an inversion may develop and trap the pollutants close to the ground (400-500 feet above sea level). If there is little wind, the pollution dispersion may be further restricted. By mid-afternoon, the sun has reached its apex and temperatures peak. The sun's radiation will cause a chemical reaction between the volatile organic compounds and nitrogen oxides to form ozone. Temperatures in the 90's or above are required for maximum ozone concentrations. As the intensity of the sunlight decreases, the ozone levels also decrease. By late afternoon, most of the ozone formed during the day breaks down into other compounds, and by early evening the ground-level ozone is essentially destroyed.